Last night, I was at the Istana Nurul Iman for the banquet for President of Ukraine given by His Majesty. Today is the second day of the President's visit and in the news, there were a number of agreements etc that had been signed between Brunei and Ukraine. The banquet was interesting. We had the Russian Ambassador at our table and he was surprised that the menu was in Ukrainian language. I thought it was Russian at first but he explained that there were similarities between the Russian and Ukraine languages, there were also differences. 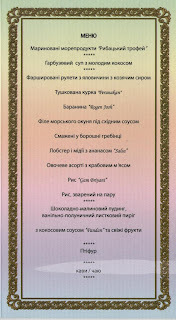 For those interested in what was served during the banquet, you have to read the menu .... in Ukranian. One of the best sources for Malay history is the Sejarah Melayu or in English known as the Malay Annals. The subjects covered in the work included the founding of the kingdom of Malacca and its relationship with neighbouring kingdoms, the advent and spread of Islam in the region, the history of the royalty in the region as well as the administrative hierarchy of the Malacca kingdom and its successor states. As the Johor Sultanate was in a state of political crisis from 1612, the sultans were desperate for political legitimacy and political reasons motivated them to take liberties with their genealogy and historical dating. During the last Book Fair at ICC, I managed to buy the Malay Annals in the English version translated by John Leyden and published in 1821. See you all there. And don't forget to bring your own reusable bags when you go shopping. There is no Planet B. Finally, No Plastic Bag Weekend is Here! Last Thursday, His Majesty The Sultan and Yang Di-Pertuan of Brunei Darussalam visited the newly developed housing program at Meragang. About 2,000 houses are currently being built on this site overlooking the South China Sea and the Meragang Beach across the Muara-Tutong Highway. Meragang which had been in relative isolation will have more than 10,000 people suddenly living among its hills and valleys by the end of 2012. Not many know Meragang before the Housing Development Department selected the area as one of its housing estates under the National Housing Program. Those who knew the name mostly knew it as the Meragang Beach. But even today, the Meragang Beach is relatively untouched compared to the Muara or Serasa Beaches nearby. 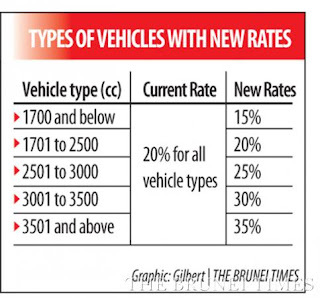 Last night's news on the new excise duties for cars was good news for buyers of small or hybrid cars. But those who are hankering after the muscle type diesel hungry powerful engine SUV, you have to pay higher duties and more expensive cars. Diesel subsidies are just too high and many of us are using it for our fuel hungry SUVs. His Majesty Sultan Haji Hassanal Bolkiah Mu'izzaddin Waddaulah Ibni Al-Marhum Sultan Haji Omar Ali Saifuddien Sa'adul Khairi Waddien, the Sultan and Yang Di-Pertuan of Brunei Darussalam has consented for the change to the rate of Vehicle Excise Duty through the Excise Order 2006 Amendment which will take effect from April 1st, 2011. I received the following information from the US Embassy. Hope it will come in useful to readers. U.S. EMBASSY INVITES APPLICATION FOR PRESTIGIOUS FULBRIGHT GRANT. The Embassy of the United States of America is pleased to announce that applications are now being accepted for the Fulbright grant for graduate study. This prestigious flagship international educational exchange program, sponsored by the U.S. Government, is designed to increase mutual understanding between the people of the United States and the people of Fulbright eligible nations. The Fulbright Program was established in 1946 under legislation introduced by the late Senator J. William Fulbright of Arkansas, and is administered by the Department of State and the Institute of International Education (IIE). 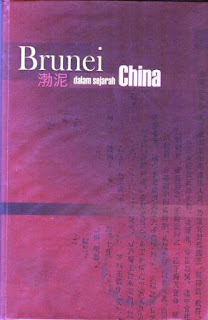 The Minister of Culture, Youth and Sports stated recently during the launching of new books published by the Brunei History Centre that history is crucial for the life of a nation and in determining the survival of its race, development of its civilisation and also nation-building of a country and community. The Brunei History Centre, as the premier national institution responsible for researching, collecting, keeping and publishing Brunei history in that role has just published eight new books and two journals. Do you know what is in our landfills? Do you know how many landfills do we have in the country? Do you care? If we don't do anything, there will be more landfills taking up valuable land spaces and creating environmental problems. Out of the top 3, the ones that do not biodegrade well is plastics. Over 1/5 of all waste is plastics and the majority of plastic waste are mostly shopping plastic bags. That's right. Those thin flimsy plastic bags are in the world's landfills and not just us here in Brunei. Sir Winston Churchill, the British Prime Minister during the Second World War said that “History is written by the Victors”; while Napoleon Bonaparte, the French General and Emperor during the 18th century cynically said that “History is a set of lies agreed upon”. George Orwell, the author of ‘Nineteen Eighty-Four’ wrote that “… He who controls the present, controls the past. He who controls the past, controls the future ...” From here we can see that in the study of history, managing the historical records is of crucial importance. The creation of any histories can in many ways be manipulated by the management of the historical records. One of the best descriptions about life in Brunei in the mid 19th century was written by Sir Spenser St John. Sir Spenser St John was the British Consul in Brunei in 1856 when he was 31 years old. His diplomatic career began when his father introduced him to James Brooke who then was the first White Rajah of Sarawak. St John was appointed as the Private Secretary to James Brooke before being appointed as the British Consul to Brunei. In 1863, he was appointed as the charge d’affaires to Haiti. From his stint in Borneo he wrote three books, the first, “Life in the Forests of the Far East” (in two volumes) were written in 1862 and two biographies of James Brooke which were produced in 1879 and 1899. He died in 1910 at the age of 85.